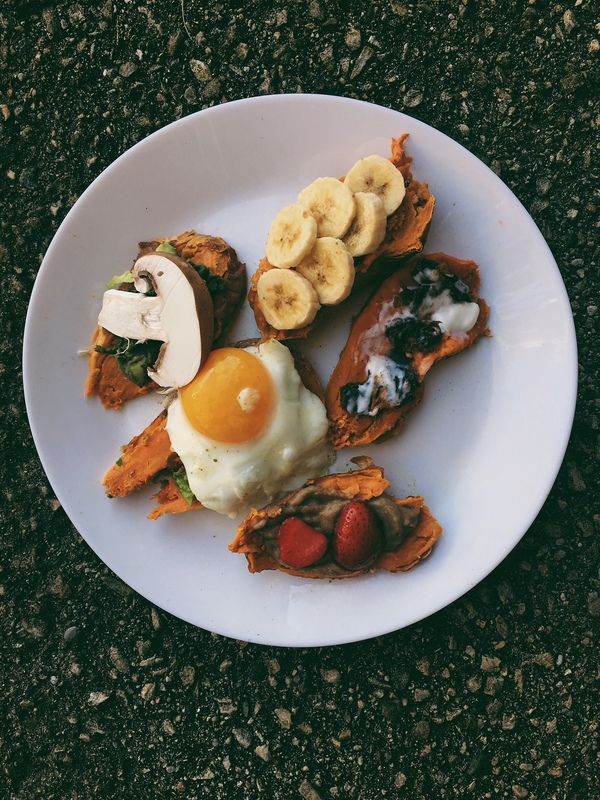 While I love making this breakfast, these toasts make a perfect lunch, dinner, or snack. They are one of the recipes found in my breakfast cookbook, Cassie’s Cookery, available on the home page of my blog– but I thought I’d share it today! 1. First, wash and prick sweet potato. You can bake it in the oven, but I always just make mine in the microwave, on high for 5-7 minutes. Allow potato to cool. 2. Slice potato into five thin “slabs” lengthwise. Top one with a bit of avocado and egg, plus salt and pepper. On another slab, top with more avocado, and sliced mushroom and nutritional yeast. Another slab gets the cocoa mixture and strawberries. Spread another with peanut butter and top with banana. The last one gets the date, coconut, and cinnamon. Season with salt and pepper as desired. Enjoy! !